Please follow the steps found on this page to download and fill out all the forms digitally. Please download the appropriate form by clicking one of the buttons below. 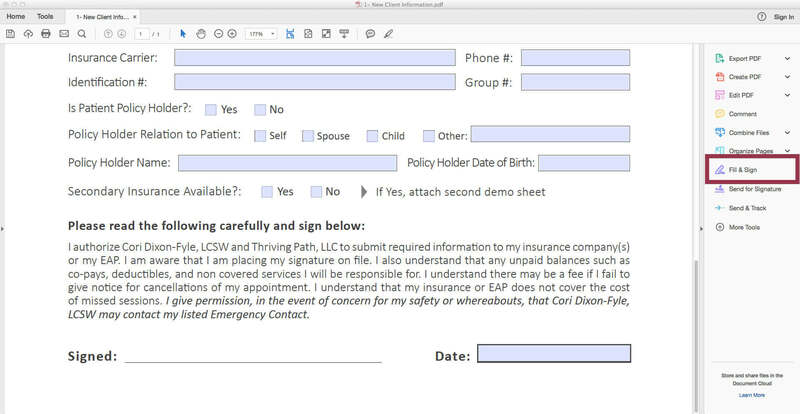 Make sure to use “tab” to ensure that you filled out and signed all of the required parts of the paperwork. 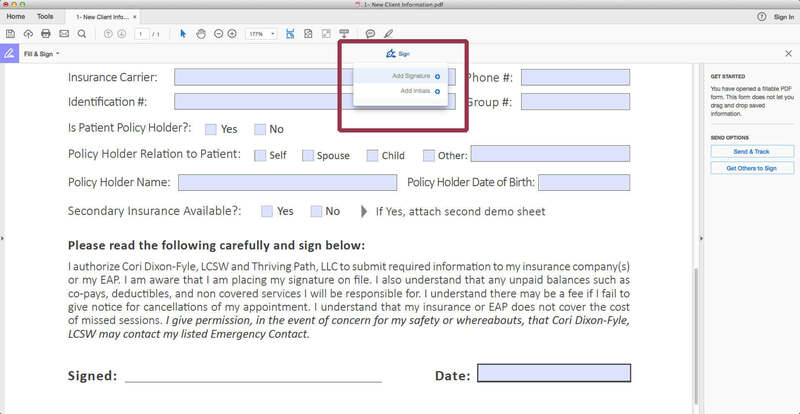 Note that if you fill out the form through the Chrome browser, you have to click on the Print button on the top right and change the Destination to Save as PDF. The form will be blank if you click on the Download button instead. 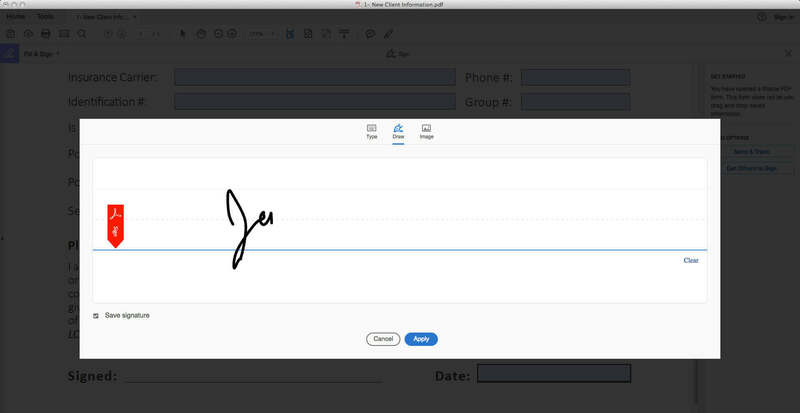 It is also possible to place your signature digitally using Adobe Acrobat. Simply click on Tools > Fill & Sign (see screenshots below). Then you will see a new Sign option. Click on Sign > Add Signature > Draw to draw in your signature using your mouse. Then click Apply and just click on the line that you wish to add your signature to. You can resize the signature box if needed. 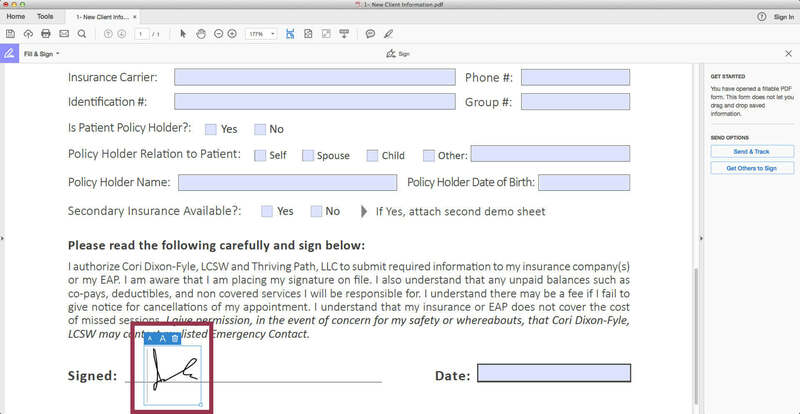 After you fill and sign the forms, please save to your computer and then attach the file to an email. Please send to Cori at cori@thrivingpath.com. Once Cori Dixon-Fyle, LCSW receives your forms, she will then sign the necessary forms and send back to you with both signatures. Thank you.